Dead of Night, the compelling and deceptively written new novel by Michael Stanley, is out now from Jonathan Ball Publishers. Fleeing South Africa, she goes undercover in Vietnam, trying to discover the truth before she’s exposed by the local mafia. Discovering the plot behind the money is only half the battle. Now she must convince the South African authorities to take action before it’s too late, both for the rhinos and for her. 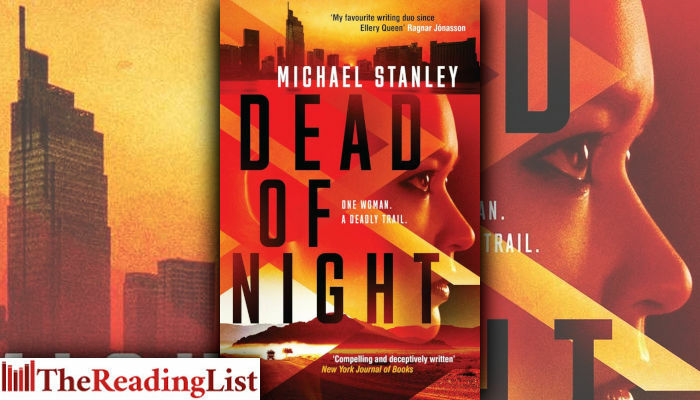 Fast-paced, relevant and chilling, Dead of Night is a stunning new thriller from Michael Stanley, author of the award-winning Detective Kubu series, introducing an intriguing new protagonist, while exposing one of the most vicious conflicts on the African continent. Detective David ‘Kubu’ Bengu is a wonderful creation, complex and beguiling. The exotic smells and sounds of Botswana fill the pages as well as the changes and struggles of a country brimming with modern technology yet fiercely clinging to old traditions. Compelling and deceptively written. A wonderful, original voice – McCall Smith with a dark edge and even darker underbelly. Under the African sun, Michael Stanley’s Detective Kubu investigates crimes as dark as the darkest of Nordic Noir. Call it Sunshine Noir, if you will – a must read. Michael Stanley is the writing team of Michael Sears and Stanley Trollip. Both were born in South Africa and have worked in academia and business. Stanley was an educational psychologist, specialising in the application of computers to teaching and learning, and is a pilot. Michael specialises in image processing and remote sensing, and teaches at Wits University. On a flying trip to Botswana, they watched a pack of hyenas hunt, kill and devour a wildebeest, eating both flesh and bones. That gave them the premise for their first mystery, A Carrion Death, which introduced Detective ‘Kubu’ Bengu of the Botswana Criminal Investigation Department. It was a finalist for five awards, including the Crime Writers’ Association Debut Dagger. The series has been critically acclaimed, and their third book, Death of the Mantis, won the Barry Award for Best Paperback Original mystery and was a finalist for an Edgar award. Deadly Harvest was a finalist for an International Thriller Writers’ award. A Death in the Family and Dying to Live are the latest in the Detective Kubu series, published in 2017 by Orenda Books.